Thrillride Band | Genre-Jumping Retro Party Band! From retro-party rock, dance-funk, sassy R&B, rowdy country, and amazing originals…Thrillride’s got what ya want! All delivered with the energy and professionalism of a touring national act…for much less! 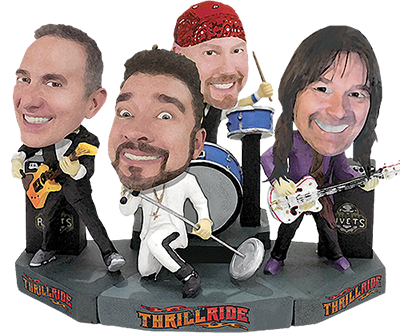 Thrillride’s a very popular NW band that can effortlessly mix rock, funk, R&B, country, and even a bunch of great originals to create an awesome show! Perfect for events with wide demographic attendance, such as Fairs, Festivals, Casinos, Corporate/private Parties, Community Events, Nightclubs, Rodeos, Beer Gardens and more! We can provide full sound and lights! Our system is perfect for small to mid-size shows. You’ll work directly with the band, so you’ll get exactly what YOU want. And, we’ll work with you to create the perfect entertainment package within your budget. Variety is the spice of life! And, because events have such a wide demographic, Thrillride is the ideal spice! We can adjust any show to cater to your specific demographic. More rock? oh my yes! More country? YeeHaa! Just let us know and you got it. Live at Coyotes in Hillsboro!